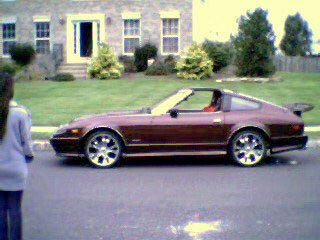 Datsun 280ZX - Thomas H. - 1982 280ZX - Somerset, NJ - Motorsport Auto Z Gallery! This is my 82 280ZX. There are soo many things I have done to it. Motorsport full body kit, the biggest whale tail wing I could find from motorsport. KMC 18 inch floss rims and 225/35/18 inch nang kang tires. Halo style headlights protected by clear covers. custom mesh grill with 280ZX on it. Two 4 inch l.e.d lit exhaust tips along with a full custom exhaust it has a nice low growl. the engine is up to 60,000 mile and the car has NO rust or rot.. For a Jersey car that is almost unspeakable. Aside from the kit and wing the paint is original. aside from the exhaust the only thing making the car a little faster is the KNN intake. the engine is well kept and has a few hi-lights like new NGK wire clean crack free hoses and wire oh yea and the polished ZX oil cap! The interior has a competition stereo consisting of 2 ten inch image dynamic sub woofers sitting in a fiberglass enclosure painted the same color as the car.